Robyn here, and I butted in the Design Team line I was so excited to share with y'all. The new stamps have jump started my creativity and a GirlsNightOut with all the amazing ladies at my LocalStampShop nudged me into this quilling technique. 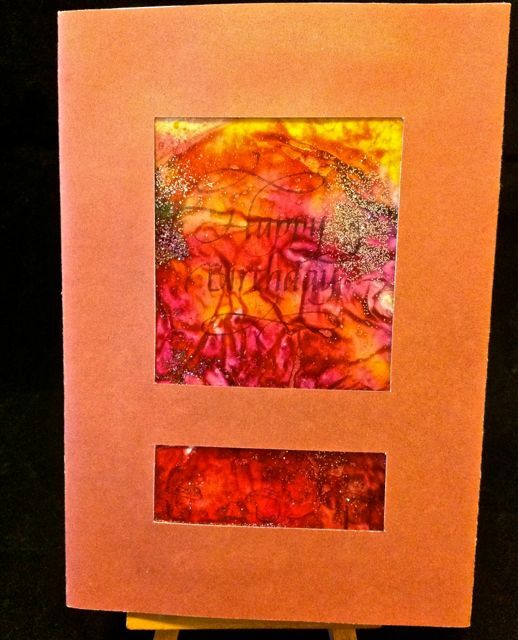 The stamp is inked with VersaFine Sepia and thermal embossed clear, and colorized with Distress Tumbled Glass and Antique Linen. 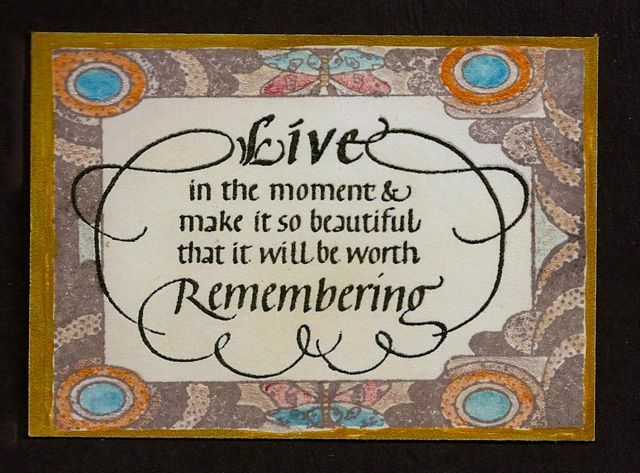 The frame is created with stash, a vintage doily and scraps of handmade paper, all held in place with a frame constructed from Spellbinders Resplendent Rectangle. Can you see where I pieced it? 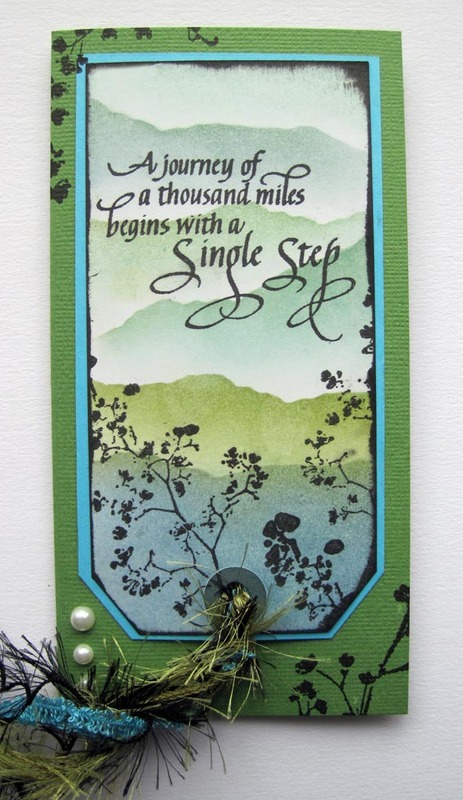 Forgive the lack of step by step tutorial, this card came together by magic! I ramble on a bit more about my Mom here, if you want to hop over with your tissues! Please be sure to post your own creations with your new Quietfire Design stamps. Hello Everyone, Terre here with a heart felt card! 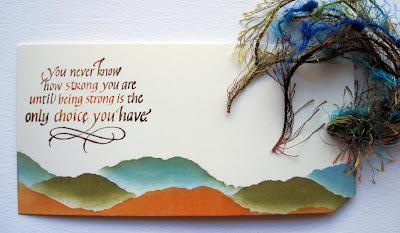 I just received this beautiful sentiment stamp in the mail today just in time for my blog post! 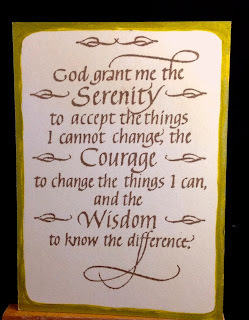 "God Grant Me the Serenity" boy those five little words have such a meaning! Robyn here, excited to be sharing several takes on one of Quietfire Designs newest hand lettered quotes, and the evolution of a card. 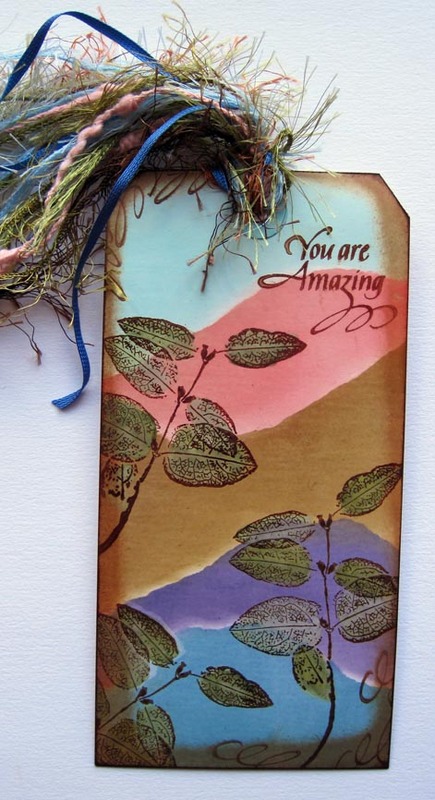 Suzanne recently shared a comment that one reason folks like her stamps, is, the same stamp can be used in so many different ways, form simple to complex designs. "How long did it take you to make that?" is the most asked comment I get on the blog and live demoing. "On a good day just the right amount of time and on a bad day a bit longer." ( not counting thinking up the idea). 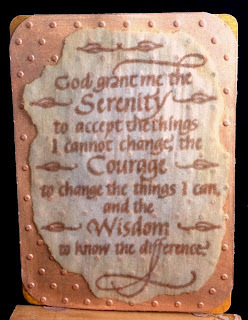 Simply stamped with VersaFine Sepia and colorized with Distress Old Paper. 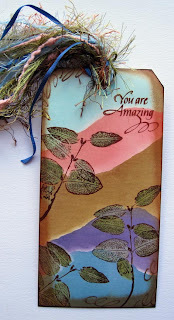 Adding just one new element- a hand drawn and inked border, this second ATC took under 10 minutes. Jumping ahead just a bit, on the third ATC I added a backing panel from stash, a second layer embossed with Cuttlebug Swiss Dots (if I could have just one embossing folder this would be it), and stamped and thermal embossed clear on some tracing vellum. Maybe 15 minutes. Which brings us to the lead card. and Scalloped Labels One and Labels One. 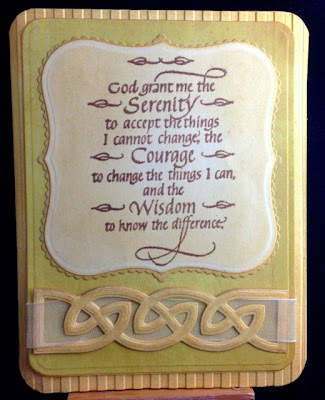 I laced some ribbon through one of the Spellbinders Celtic Accents to finish it off. 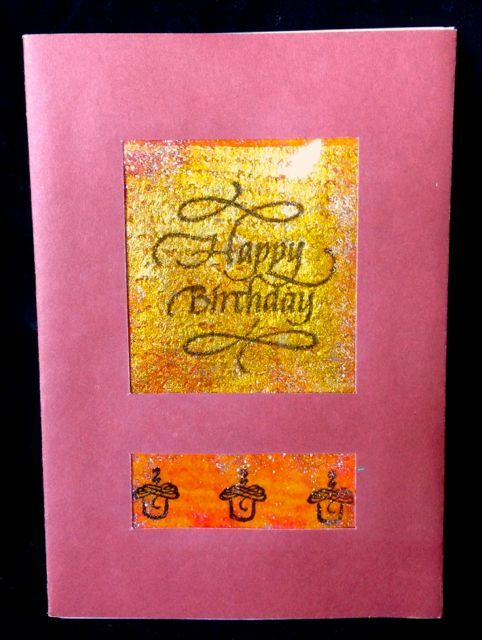 So, 1 stamp, 3 ink pads, 2 embossing folders, some misc stash ...add your imagination and the possibilities are endless! Any of the new stamps can be used in this way- simple to elegantly complex. Yes, we have new stamps!. All the Designers will have them soon and they'll be creating up a storm, so keep watching - especially our Facebook page and our Pinterest page. 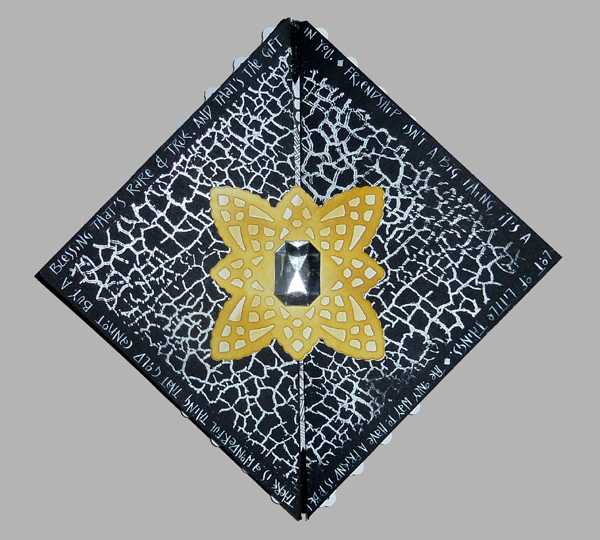 US customers who wish to purchase in USD using PayPal may wish to order on our Etsy shop. For this next quote, there was a bit of a challenge tracking down the author. We finally decided that it belonged to Fanny Crosby who was a blind American hymn writer. Here is a link to the Wikipedia information about her. Wonderful! I die cut several border lengths (Spellbinders "Lace Doily Accents") from white cardstock, cut them to the length I wanted and then cut 45º angles on the ends. For this card each were 5.5" long. Cut a square 4 1/8" from the same white cardstock and adhere the edges with Double sided tape. 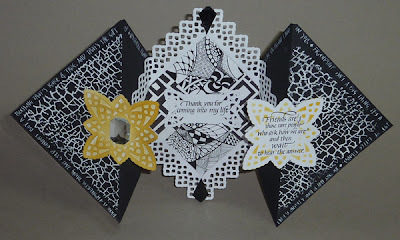 Cut the picot/teardrop shapes at each corner using the die cut shape as a template, inked them with Distress Black Soot and embossed with black embossing powder. Cut 2 black cardstock squares 5.5" and adhered them to the back of the white square (see template below) Scored my lines for my folds using a Scor-It board. 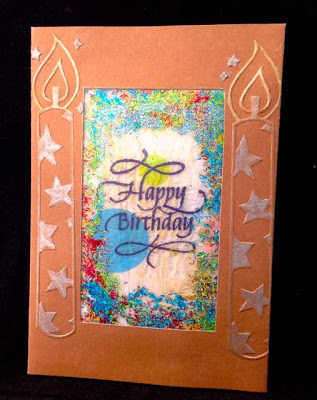 Created a stencil from some copy paper so that I would have a plain border around my card and the stamped "crackle" image would only land in the triangle area I wanted stamped. 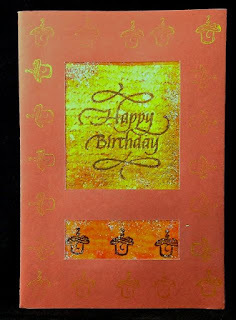 Stamped the crackle stamp (Local King Rubber) using Perfect Medium and embossing with white embossing powder. Cut 4 small squares approx 1.75" for the inside. 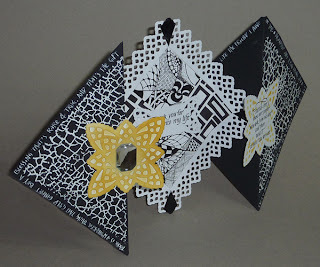 Two of them from black & white scrapbook paper, and 2 from plain paper which I did some Zentangle designs on connecting the lines from the scrapbook papers so it became a cohesvie design. Die cut the tag from the same die set, stamped the sentiment (companion stamp set "Some People Come") with Versafine Black Onyx and clear embossed. Adhered to center of inside square. Die cut the large center piece from white cardstock with the same die set. Die cut two more from white cardstock, using a hard rubber mallet to only cut the outside edges. 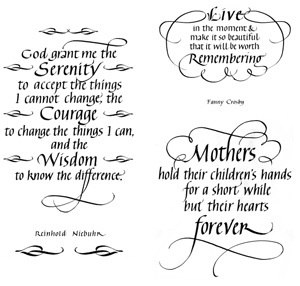 Stamp the quote on one of them with the Versafine black and clear emboss. Then use the detailed die cut as a stencil, sponging Distress Mustard Seed lightly through the openings. Did the same sponging on the 2nd piece and then adhered it to the detailed die cut. Adhered this double layer to the front triangle (putting tape only on the left half side), adhering the design right up to the center of the picot edges. 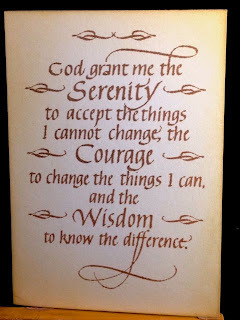 Apply some double sided tape to the quote piece (only on the right half section). 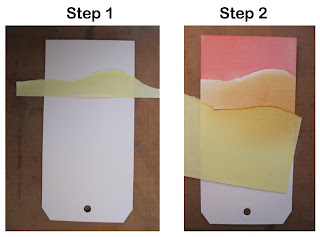 Place a piece of removable tape to the underside of the yellow piece and place the quote piece to it, aligning it perfectly. Fold your triangle flaps together and press down on the center to adhere the quote piece. Carefully remove the removable tape. - Both sides are perfectly aligned. 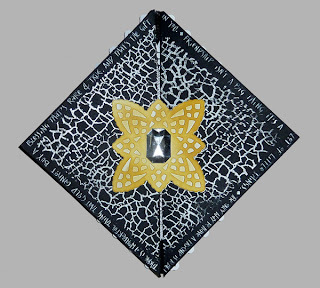 Adhere a large jewel in the center. I added the quotes around the edges with a pointed pen and a white mixture of ink (Copic Opaque White mixed with some H2º). I also cut a miniscule amount from the bottom points so they would be flat points and stand more easily. There is a wonderful thing that gold cannot buy. A blessing that's rare and true. And that's the gift of a wonderful friend, like the friend I have in you. Friendship isn't a big thing, it's a lot of little things. Hi again, fellow Quietfire fans! 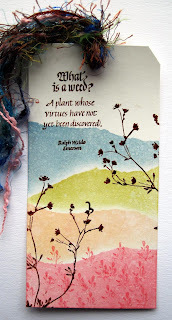 Guest Designer Bibi from Nature's Print Shop here, with my second entry for March. This time I want to show you how I make my landscapes, which is really easy. 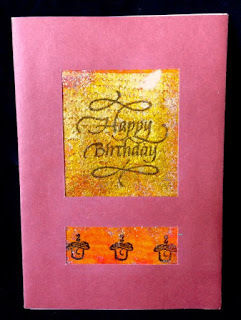 All you need is some ink pads, ink applicators (ink blending foam), tags or cardstock, and some rubber stamps. First, I tear up two or three pieces from the sticky part of a Post-It note, so my masks stay still on the tag when I start smooshing ink. I prefer to turn my tag upside down and work my way downwards. I find it easier to do it this way because I can see better where I smoosh the ink. Just try it out and you'll soon find out which way you like to do it. Sometimes I use naturalistic looking colors, but I find that I usually choose colors that don't look like any landscape I have seen, except in my imagination. 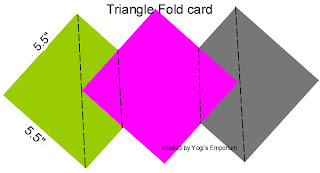 Adhere your tags to a card if you like. I love fiber, so I often add a lot of those. On the tag below, I clear embossed the sentiment first. The moon was masked off with a circle punched out from a Post-It note. I love to work on smooth surfaces, such as coated tags and Speciality Stamping Paper from Ranger. The ink applicators run more smoothly over these surfaces and the inks blend better, too. Sherry here today and it’s my turn to post a project! With the first day of Spring just a few days away and Easter just around the corner, my thoughts are turning to warm weather and my favorite time of the year. I thought I would get an early jump on Mother’s Day and make my mom something special this year . . . If I can wait until then to give it to her! 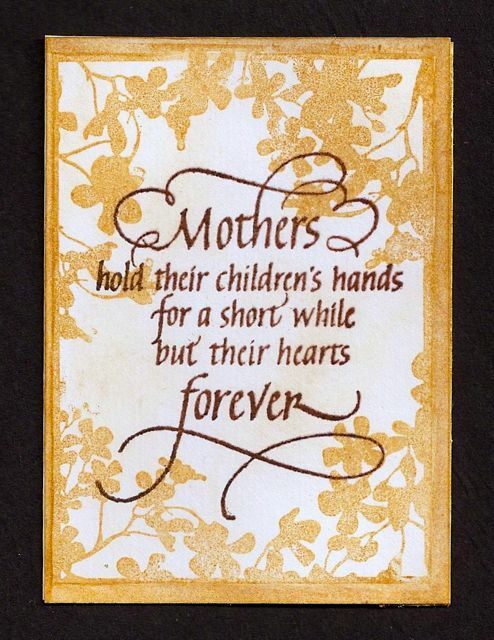 The Quietfire sentiment I used is A Mother is She. 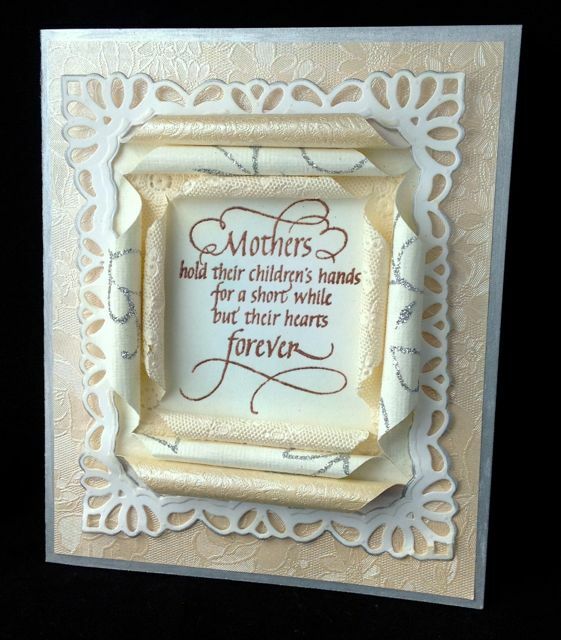 The frame is made from chipboard that was die cut with Spellbinders Grand Labels One and Grand Ovals. 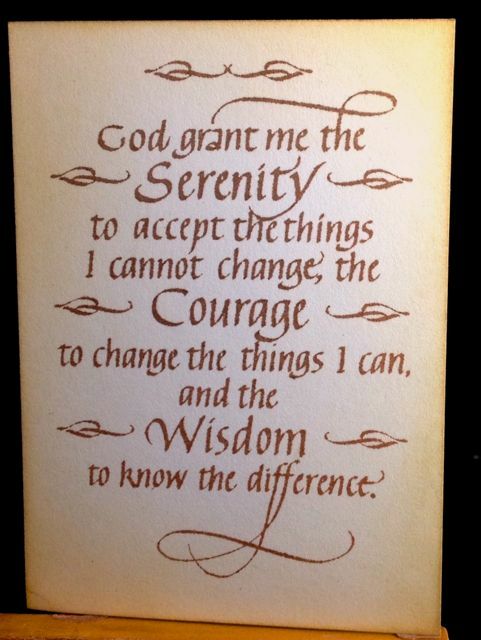 The sentiment was stamped in black on watercolor paper and then die cut/embossed with the smallest Grand Oval. The flowers (Blossoms Five), leaves (Foliage and Rose Creations) and flourishes (Venetian Motifs) are made from watercolor paper that was die cut and then colored with Distress Stains. My goal was to keep with the colors that my mother has throughout her home . . . black, gold, taupe and hits of red, yellow and oranges. 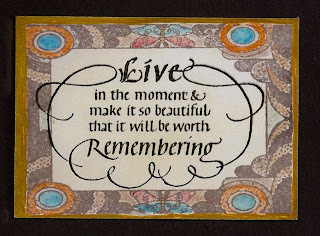 If you're like me, you're charmed by many of the Memory Box Wreath dies. 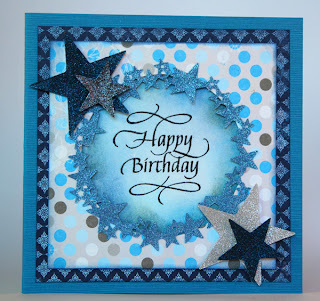 You will remember Joy Hauck, our February guest designer, made beautiful use of the Starry Wreath with her birthday card. 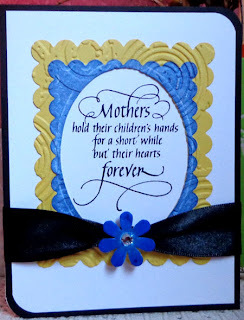 But a lot of you might not have seen this stunning Mother's Day card Joy made, again using one of the Memory Box wreath dies. For this card Joy used the Catalina Wreath die. Check out our new selection of Memory Box dies. We're pretty sure you'll be charmed, too! Here are thumbnail links to some of the items Joy used! Hi Everyone! It's Holly here today and my project is another example of the Caught In Crystal Technique, but done a little differently this time. 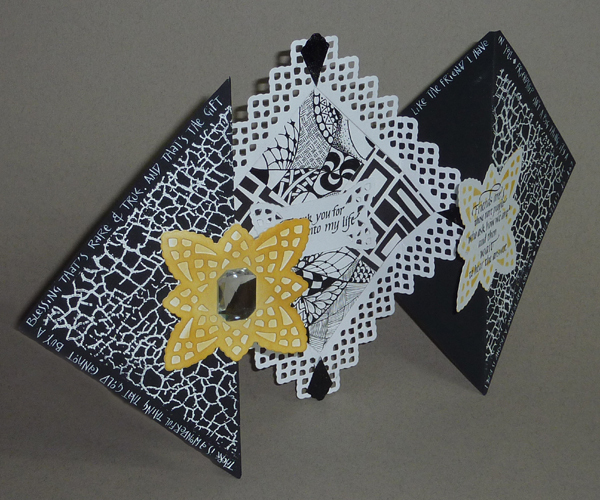 I stamped the flower heart from Valentine's Day/Love 2013 onto a transparency using jet black Stazon ink . Once dry, I flipped the transparency over and worked on the back side. I smooshed Distress inks onto the transparency and once the area was well covered, I dribbled on some Future Floor Finish. I mixed it all around, sprinkled glitter over it and followed up with the crumpled tissue paper. Pressed it all down, then dried it. I cut out the hearts and from a scrap, cut out a stem shape. Drew a few lines around the stem with a Sharpie. I wanted more green to show on the heart/petals so I just sponged more on the back and let it dry. And it worked! So, I pushed my luck and sprayed a little shimmer spritz on it too. 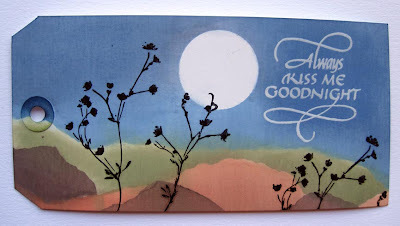 Using Black Archival ink I stamped Always Kiss Me Goodnight, also from Valentine's Day/Love 2013, onto a scrap of white, then cut out KISS ME. I embossed white cardstock with Spellbinders Expandable Botanical Garden Die , sponged around the edge of it and the two words. 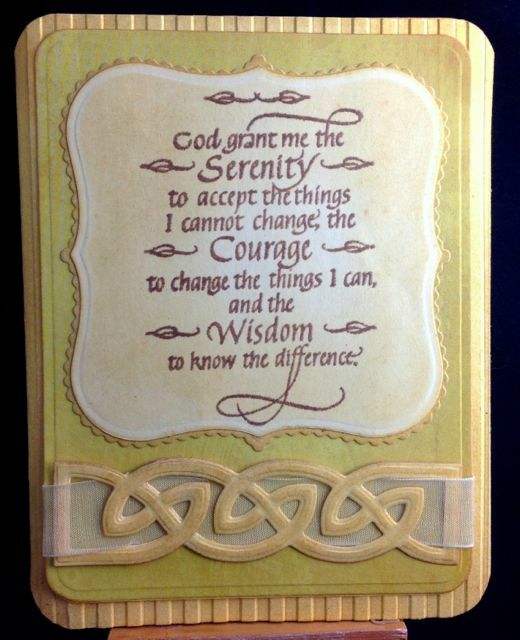 I attached the white to the green card base, then adhered the shamrock petals with glue dots and glued the words on. The sparkle and shimmer in real life is stunning. Thanks for looking and remember to avoid the pinch on Sunday and wear something green! Well hello there! Terre here with a fun and flirty card! 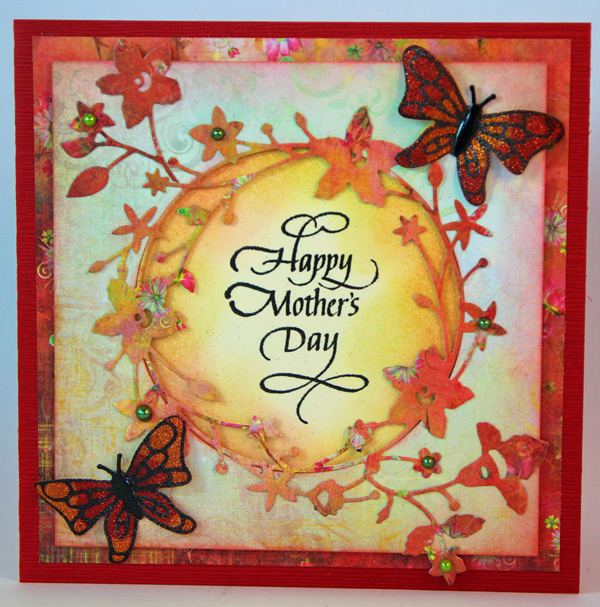 This card was created using Quietfire Designs Butterfly Circles May the Wings Stamp set. 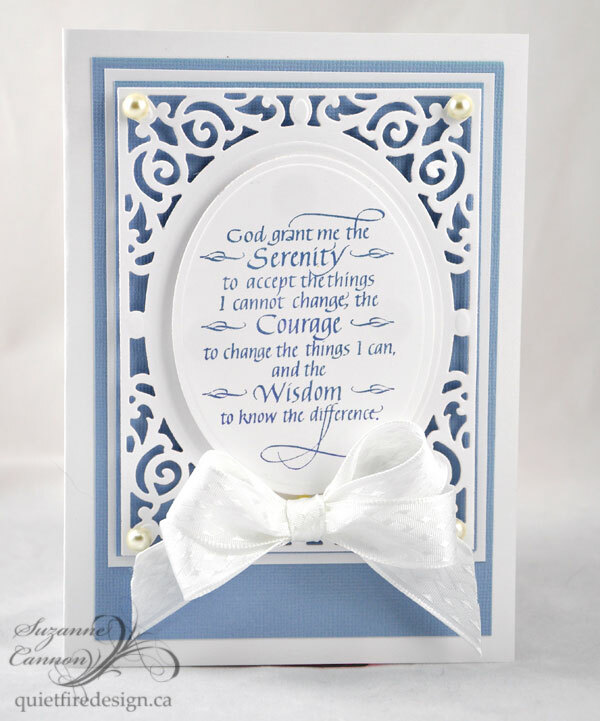 For my paper line today I chose to use My Mind's Eye "indie chic" paper, the blue satin ribbon is from May Arts, the beautiful bling swirls are from Want2Scrap and the die templates are Le Papillion Two and Floral Ovals from Spellbinders. 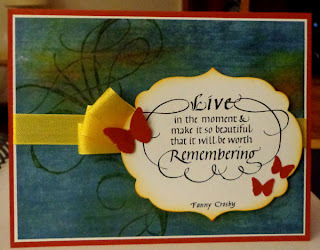 I air brushed the die template then stamped my Butterfly Circles May the Wings sentiment, it added just enough pop of color. 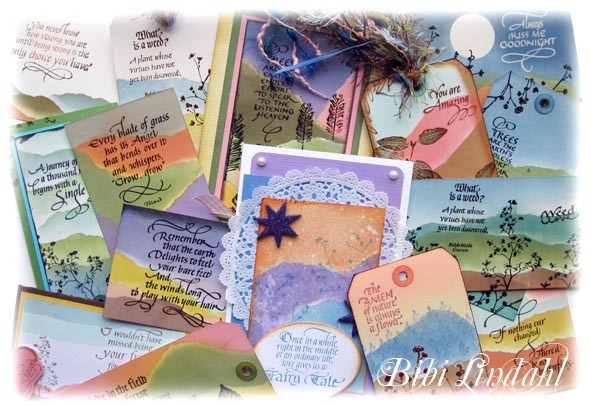 Thank you for stopping by my blog post today, I hope you will give this amazing stamp set a try, we would love to see what you create so make sure to find us on Facebook and show us what you create. Crafty smiles, Terre! Robyn here feeling spring feverish! I am the March/April /May Birthday Card lady for my Women's Circle and I was inspired by Holly's Caught in Crystal technique and my continuing quest to use up what I have. I found these pre cut card bases and they were crying out for a transparent inset. 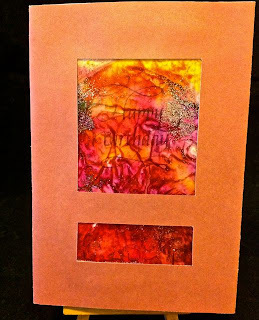 StazOn- maybe my pad is dry- My attempts left the sentiment too hard to read when I stamped on the plastic, and my thermal emboss attempts were trash! 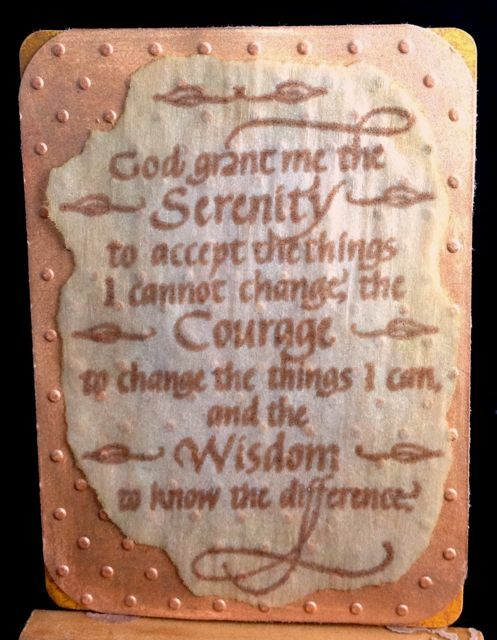 I progressed to stamping on the tissue, embossing and pooling the glaze and glitter onto the plastic, placing it where I wanted it to go by carefully holding it over the tissue and then pressing down. Leave plenty of extra plastic so you can trim off any excess that gets messy with the glaze. I though this looked a bit plain and added the cupcakes as a border- wish I had a delete button on my card base! Now I'm getting something I like- more control needed with the glitter. 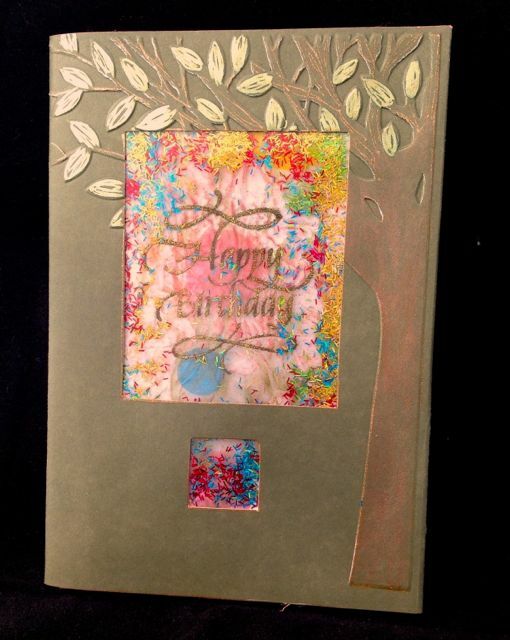 The tree is a new embossing folder by Darsie ( ditto the candles below) colored with Stardust pens. A wet brush moves the color around. I held back on adding something-buttons? ribbon? in the empty space. Please leave a comment and post your own Caught in Crystal Adventures.